The Australian Strategic Policy Institute (ASPI) has released a discussion paper that called for Australia to increase the nation’s strategic and economic efforts on supporting the development and security of the Indian Ocean region. While much of the world's attention is focused on the precarious situation in the South China Sea (SCS), the Indian Ocean and surrounding region has quietly emerged as the next major epicentre of global economic, political and strategic power, driven by Asia's other rising superpower, India. Recognising the potential of the region, ASPI's report, compiled by Dr David Brewster, senior research fellow with the National Security College at the Australian National University (ANU), highlights a number of the opportunities and challenges, and the need for Australia to develop, articulate and enact a dedicated approach in the region intrinsically linked to the nation's long-term prosperity and stability. "We have by far the longest coastline and by far the largest area of maritime jurisdiction of any country in the region. In one way or another, Australia relies on the Indian Ocean for much of its wealth. In 2016-17, sales of Western Australia’s mineral and petroleum industry alone totalled some $105 billion; in aggregate, around 42 per cent of Australia’s goods exports by value came from Western Australia. A very large proportion of our maritime trade, both exports and imports, crosses the Indian Ocean," the report said. Brewster highlighted the long-held belief by both the Australian public and policy makers that the nation is a 'Pacific Ocean State', which has resulted in Australia implementing a series of highly-successful and sophisticated, if not at times contentious economic, political and defence engagement strategies over the past 50 years. This focus on the Asia-Pacific region makes a great deal of sense, particularly given the positioning of key regional economic and strategic partners across what has been referred to as the 'Arc of Instability', which plays host to a range of traditional state and asymmetric economic and political challenges, however the growth of India and smaller nations surrounding it, combined with the importance of the Indian Ocean as a pillar of the national, regional and global economy, now requires renewed Australian focus. Like Australia's history of engagement with the Asia-Pacific, the nation's approach to he Indian Ocean and surrounding region will also be influenced by the increasing geo-political, economic and strategic rivalry of China and the US, both of which have various interests in the region, with the strategic environment becoming a contested space. Brewster's report also recognised the importance of developing robust, multilateral economic, political and strategic relationships with key regional powers, namely India and Indonesia, both of which are essential to securing the long-term peace and prosperity of the region, while capitalising on the opportunities of China's 'Belt and Road Initiative', expanding and enhancing focus on other Indian Ocean nations like Pakistan, Thailand, Sri Lanka and parts of west Africa into the future. Australia needs a comprehensive, whole-of-government strategy for the Indian Ocean that articulates national objectives and addresses challenges and opportunities. Australia should continue to prioritise its relationship with India as a key partner in the Indian Ocean. The onus will be on Australia to find innovative ways of developing the security relationship. Australia should articulate its preferences for China’s future strategic role in the Indian Ocean. Australia should also promote Australia–India–Indonesia trilateral co-operation arrangements, with an initial focus on co-operation in combating illegal, unreported and unregulated fishing and other transnational maritime security threats in the eastern Indian Ocean. The Australian government should focus on leveraging the world-leading expertise of Australian companies in the design, funding, ownership and operation of private infrastructure as part of its contribution to the free and open Indo-Pacific strategy in the Indian Ocean. The Royal Australian Navy should increase the regularity of its presence in the Bay of Bengal as part of an expanded commitment to working with the Indian, Sri Lankan and Bangladesh navies. Where possible, naval visits should involve multiple RAN vessels. Australia should develop a comprehensive 'blue economy' plan for the Indian Ocean and other oceans. Australia should continue to promote the effectiveness of Indian Ocean Rim Association (IORA) as the pan-regional political group. Each of these suggestions and the additional ones identified as critical to Australia's successful engagement with the Indian Ocean region requires a major shift in the way the nation's political leaders and the Australian public as a whole view the nation's foreign and defence policies, with a focus on promoting renewed, enhanced Australian presence and influence wielding in the nation's growing geo-political areas of responsibility. The government announced in late 2018 that Australia's relationship with India would be a key focal point of the 2019 Indo-Pacific Endeavour exercises, with Defence Minister Christopher Pyne saying, "Australia and India share a commitment to a peaceful and secure region, and to upholding a rules-based global order." 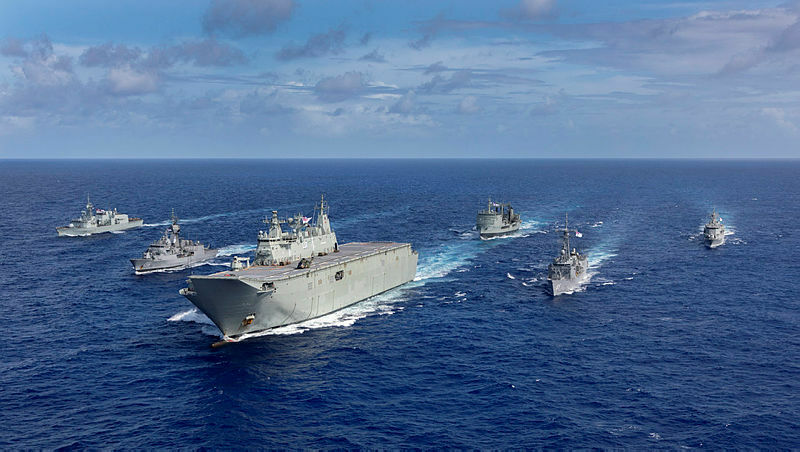 The Joint Task Force for next year’s expedition will involve up to five Royal Australian Navy vessels, including a Landing Helicopter Dock, Australian Army and Royal Australian Air Force assets and personnel, and foreign force elements. Minister Pyne added, "Indo-Pacific Endeavour 2019 is a major contribution to this effort. It reinforces Australia’s commitment to engaging all Indo-Pacific nations and promoting regional maritime security co-operation."